TriHealth, a unified health system based in Cincinnati, Ohio with over 11,000 team members was facing a communications challenge – figuring out how to engage and retain staffers at various levels of the organization. In the two-plus decades since their founding, TriHealth has experienced massive growth. Today, the system operates 125 locations throughout the region. With such rapid growth, employee engagement was suffering. A survey by Press Ganey placed the health system in the 28th percentile for employee engagement. In 2015, TriHealth hired startup veteran Tonya Hurst to lead the charge for a real change in employee engagement. Hurst knew the means and methods by which most internal communicators attract, retain, and engage their employees can be outdated, costly and time-consuming. Hurst began her work at TriHealth full of energy and with a passion for measurable change. “I had that mentality that there’s a way to get this done – no matter what it is, even if it’s incredibly challenging or really out-of-the-box. And I brought that attitude to TriHealth with me,” Hurst said. With the strong support of senior leadership, Hurst and her team went to work repairing and rebuilding the employee culture online and off. Their goal was to raise TriHealth’s employee engagement by 8 points in a year. They began ambassador and appreciation programs and designed total rewards packages. Hurst needed a way to communicate all of the great culture work that was happening. So each Tuesday, TriHealth’s Internal Communication Department shared a carefully crafted employee newsletter. Space was limited and struggles for placement ensued. “We had trouble deciding what stories and events to share in such a limited space,” Hurst shared. Additionally, team members had emails from leadership and department news to contend with. Despite attempts to keep email under control, Hurst says team members were receiving 140 hours worth of emails a week. That figure doesn’t even account for intranet content, flyers, digital signage, and mailed information. “Our staff was drowning in communications,” Hurst said. Hurst and her team realized they needed a way to cut the clutter and get the most relevant content to team members. Knowing the typical strategies for communicating were not working, Hurst was ready to apply one of her favorite startup principles to the engagement problem, Design Thinking. Hurst thought Design Thinking would engage and empower team members to be a part of the solution. Design Thinking is a framework that helps teams creatively solve problems. During the Design Thinking process, matrixed teams identify and investigate both the known and ambiguous factors of an organizational problem and attempt to find paths to a solution. It’s perfect for solving complex problems. Though the process is well-defined, it can be challenging to succeed if you don’t prepare your team (and your ego) for what may be uncovered while seeking a solution. Here are our favorite tips for succeeding with Design Thinking. Whether we recognize it or not, each and every one of us has uncertainty in our work. There is a lot of uncertainty when you start the Design Thinking process. Here you need to open your mind to look at the problem with new eyes. You will not be entering this with all of the answers and you have to be comfortable taking actions and then learning from your experiments. Even if you fail, you’re going to have so much feedback information that you can take the next step and have a little more confidence. Just keep moving forward with passion! One of the keys for pushing through real change is to be able to work well with the other teams at your company. Your tech team is like your HR department, they are approached with a ton of stuff every day. Like HR, the only time people seek out their IT department is when there is a problem. They feel battle-worn and guarded. Making your IT leadership a part of your Design Thinking process and solution building is key to adoption and success. These are left-brained folks. Involving them as early as you can in the process with the ‘why’ to have them be part of solving the problem – not just implementing the solution you came up with. You encourage, demand and/or require those around you – peers, direct reports, and superiors – to think strategically but act quickly. This is called Bias for Action. “Sometimes, we feel like we need to wait until we have all the answers and we have a perfectly scoped-out project plan and it’s gotten buy-in from all the leadership before we take that first step but, you also have to be willing to take action before you have all the answers,” Hurst shared. You might have heard this one before, it’s one of Amazon’s Principles. Amazon encourages calculated risk-taking, and so should you. Bias for Action does not mean acting without forethought…instead, Bias for Action means having an idea or premise, and understanding quickly what that market thinks of it. The fourth key to Design Thinking is to enhance your ability to let go of your own ideas and support others. Collaboration is really central to successful Design Thinking. Avoid deference to HiPPOs, and leave your ego at the door. Just because you have an idea, it doesn’t mean that it is THE idea. Open yourself up to learning from others. You have a solution. Awesome. Building to think really means quickly making prototypes and then testing. This is really central to success with Design Thinking. Your ideas are now going to be tested and either grow or move to the side for better ideas to take their places. Don’t just test one idea. Hurst suggests you open yourself up to the possibilities here and test multiple solutions and let the winner show itself. It takes many minds to tackle a big problem like employee engagement. Taking the time to recognize each contribution creates a better working environment and makes your colleagues more likely to work with you on your next big idea. Through their discovery process, TriHealth discovered they wanted their communications to foster a better, more personal connection with their team. Hurst began talking to Cerkl about personalizing TriHealth’s system-wide newsletter. Cerkl takes the content organizations are already publishing on their intranet, website, or video channels, and creates perfectly personalized content experiences for staff on email and web. “One of the main benefits of Cerkl for our team is that it just saves us a ton of time,” Hurst said. Cerkl integrated directly into TriHealth’s existing intranet, pulling that content, and the other content they post in, automatically. Then Cerkl’s artificial intelligence curates and delivers all significant content to team members via a beautiful email newsletter. “If you are having to take the content you post one place and then you are posting it again in your newsletter that takes a lot of time,” Hurst said. 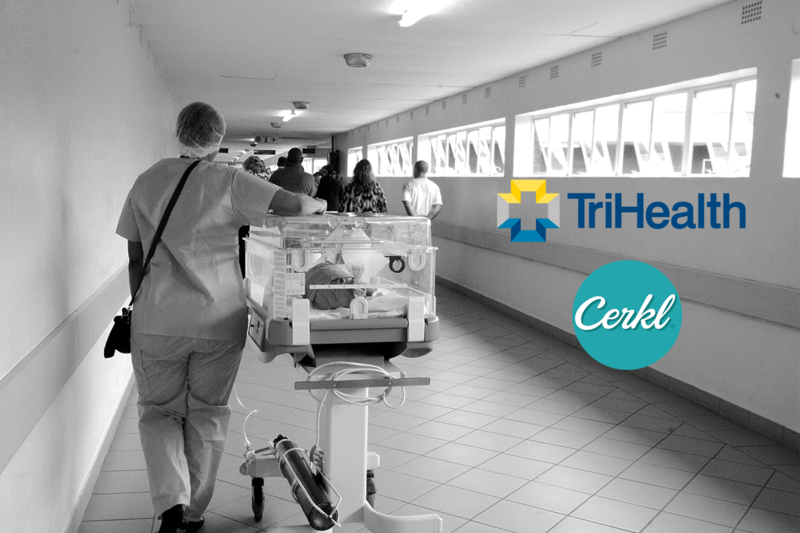 Cerkl’s intranet integration is saving TriHealth staff 40 hours of copy and paste work a month. Cerkl allows team members to chose the day, time, format, and categories for the newsletter. Using the employee’s click and open behavior, Cerkl learns and shares what content would do best with each individual. Before Cerkl, the Internal Communications department had to field and manage many requests for the limited slots their newsletter provided. This led to jockeying for position among different departments and the Internal Communications team having to weigh the priorities of departments across the organization. Hurst believed Cerkl was working for TriHealth, but to be sure, she wanted an A/B test. Hurst decided to compare their Cerkl analytics to their opens and clicks TriHealth received for emails sent from the C-Suite. Cerkl helped TriHealth exceed their employee engagement goals, unite departments, and create an ROI-based strategy for their communications efforts.